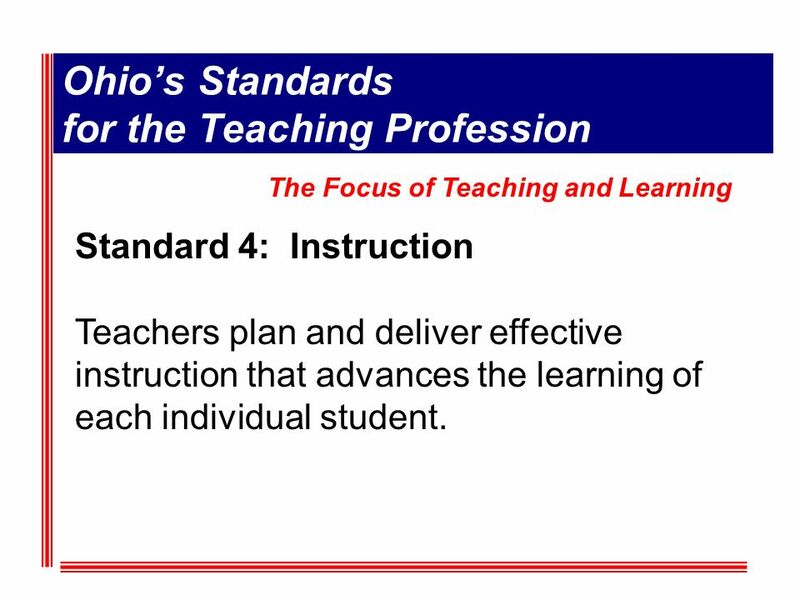 Ohios Educator Standards. 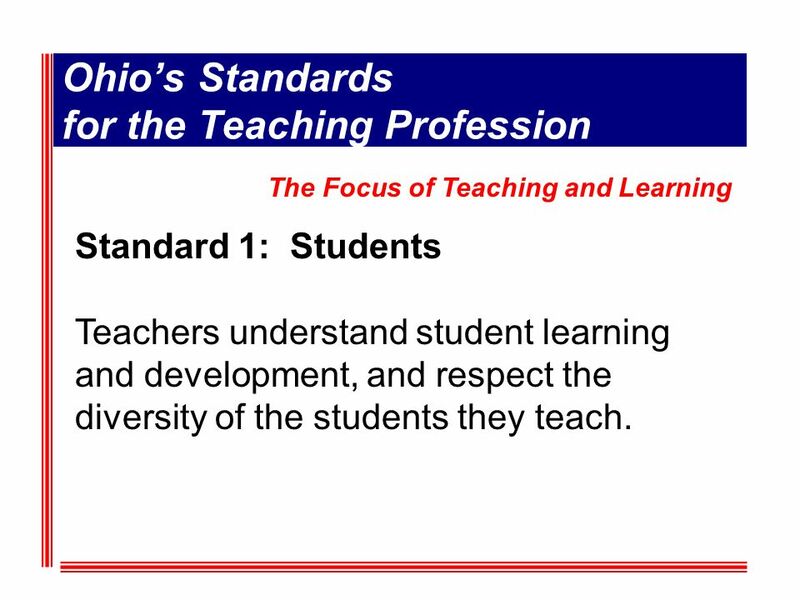 Ohios Standards for the Teaching Profession. 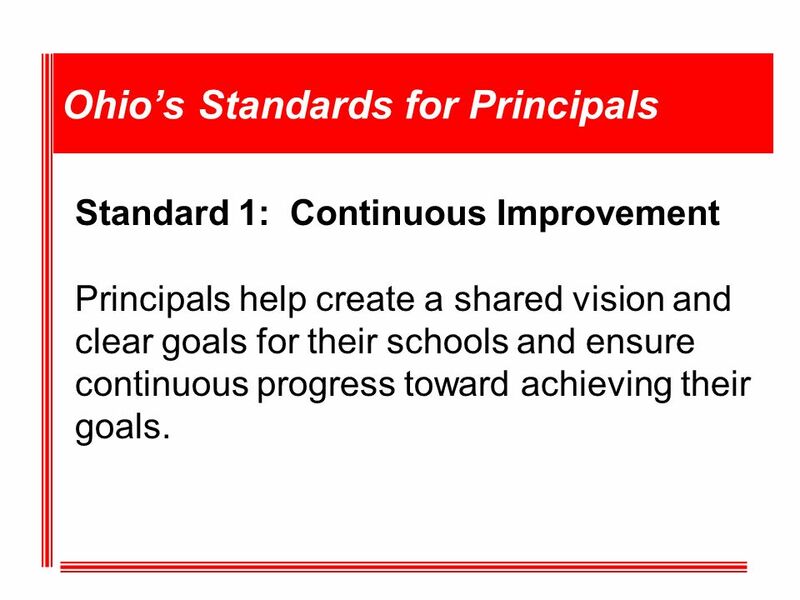 12 Standard 1: Continuous Improvement Principals help create a shared vision and clear goals for their schools and ensure continuous progress toward achieving their goals. 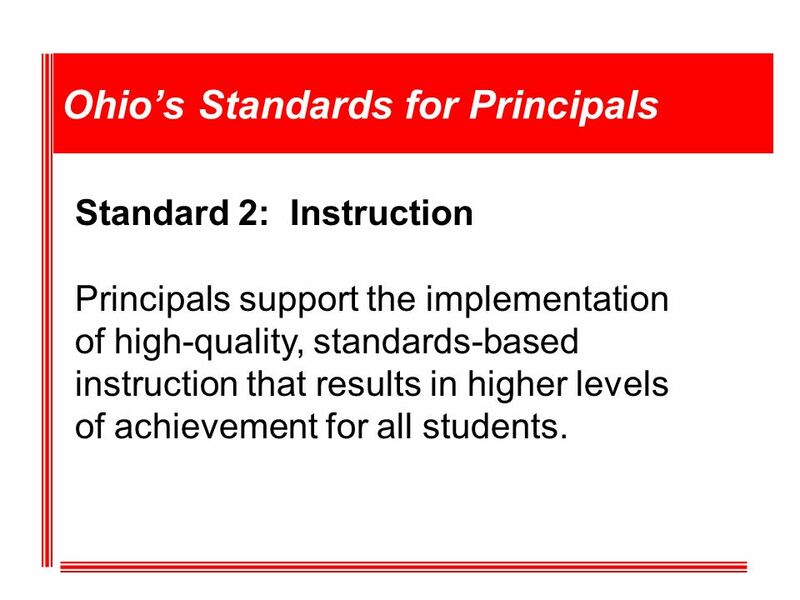 13 Ohios Standards for Principals Standard 2: Instruction Principals support the implementation of high-quality, standards-based instruction that results in higher levels of achievement for all students. 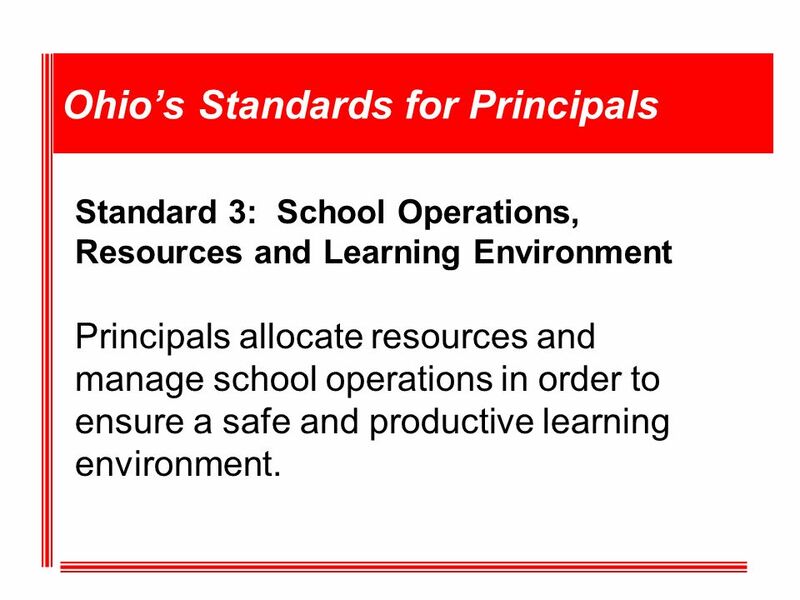 14 Ohios Standards for Principals Standard 3: School Operations, Resources and Learning Environment Principals allocate resources and manage school operations in order to ensure a safe and productive learning environment. 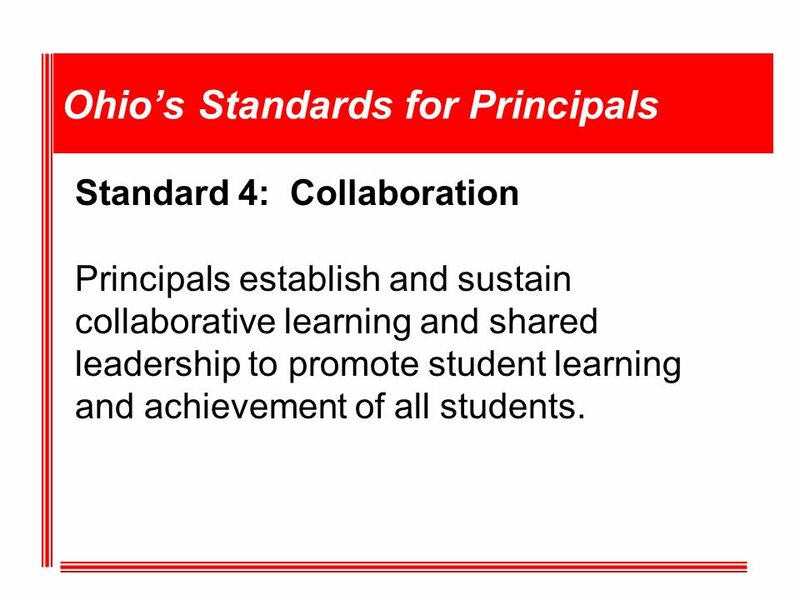 15 Ohios Standards for Principals Standard 4: Collaboration Principals establish and sustain collaborative learning and shared leadership to promote student learning and achievement of all students. 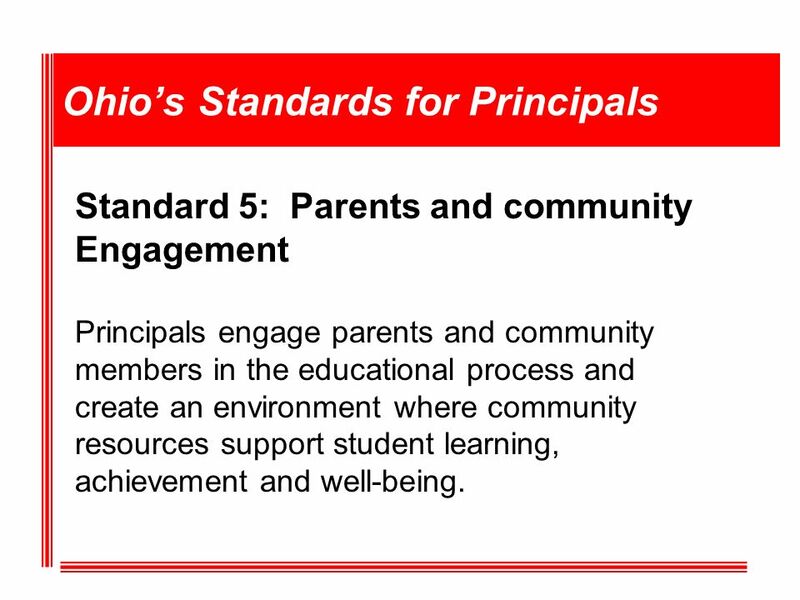 16 Ohios Standards for Principals Standard 5: Parents and community Engagement Principals engage parents and community members in the educational process and create an environment where community resources support student learning, achievement and well-being. 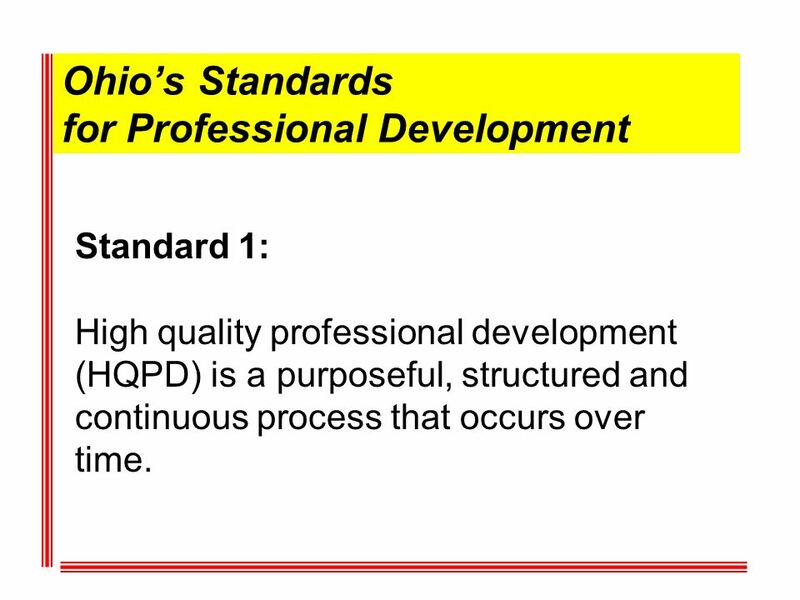 18 Standard 1: High quality professional development (HQPD) is a purposeful, structured and continuous process that occurs over time. 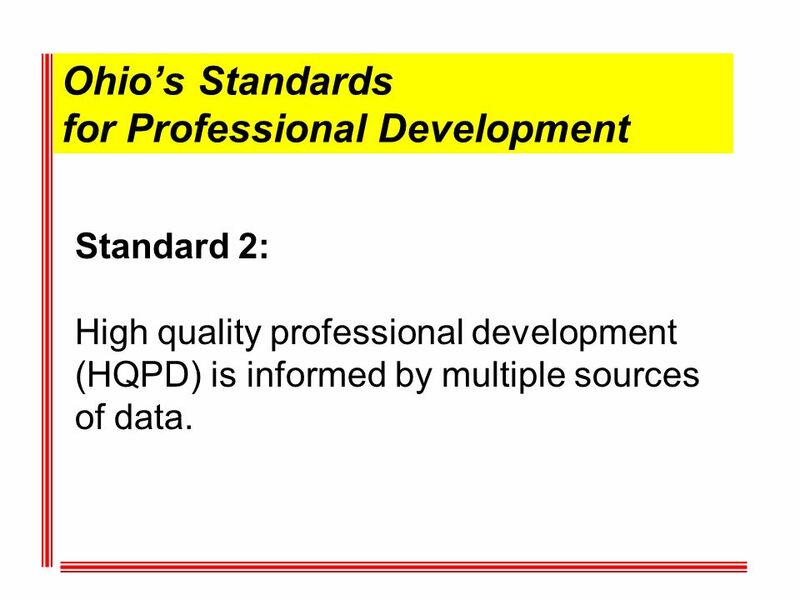 19 Ohios Standards for Professional Development Standard 2: High quality professional development (HQPD) is informed by multiple sources of data. 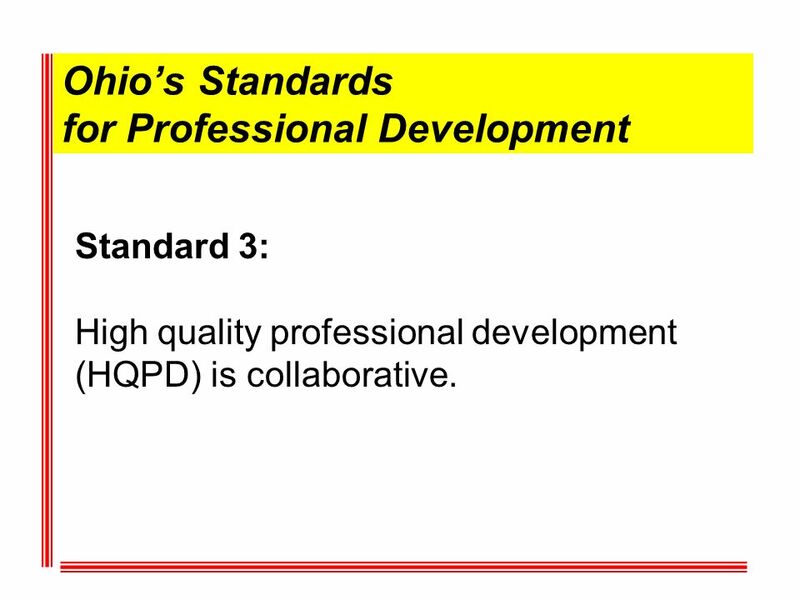 20 Ohios Standards for Professional Development Standard 3: High quality professional development (HQPD) is collaborative. 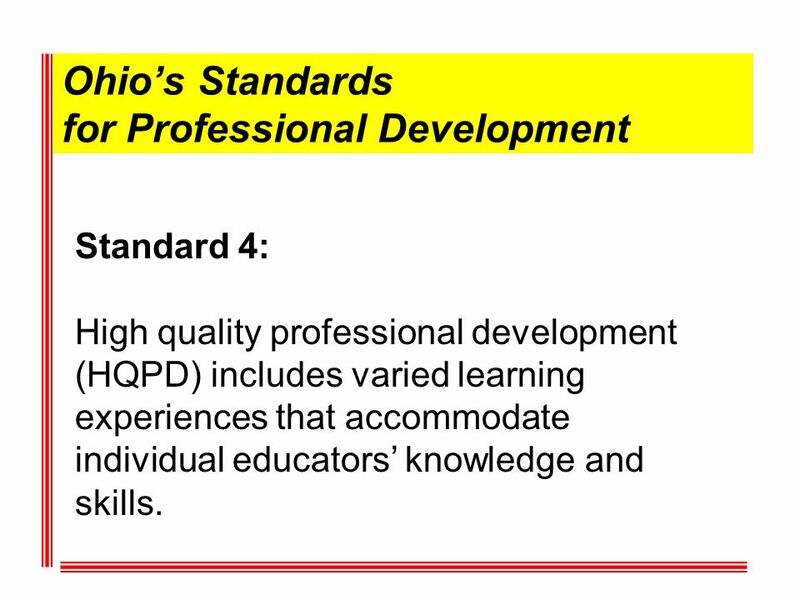 21 Ohios Standards for Professional Development Standard 4: High quality professional development (HQPD) includes varied learning experiences that accommodate individual educators knowledge and skills. 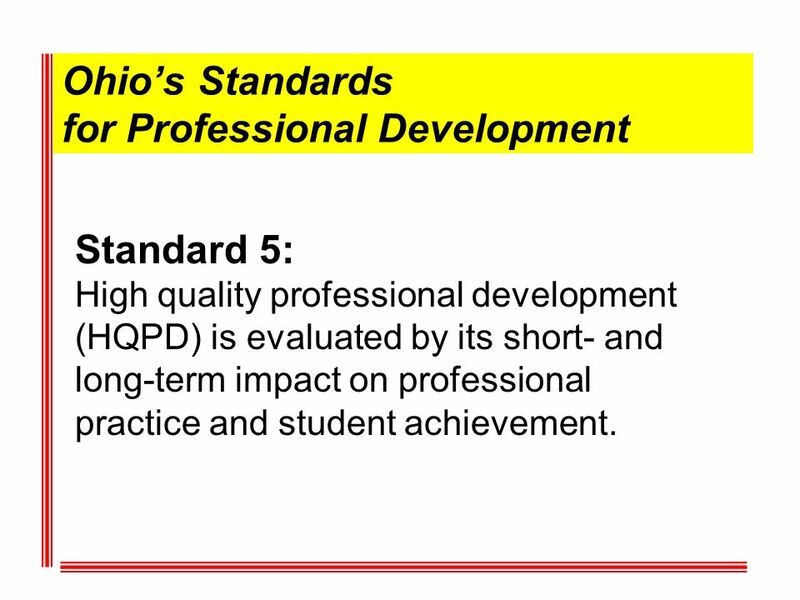 22 Ohios Standards for Professional Development Standard 5: High quality professional development (HQPD) is evaluated by its short- and long-term impact on professional practice and student achievement. 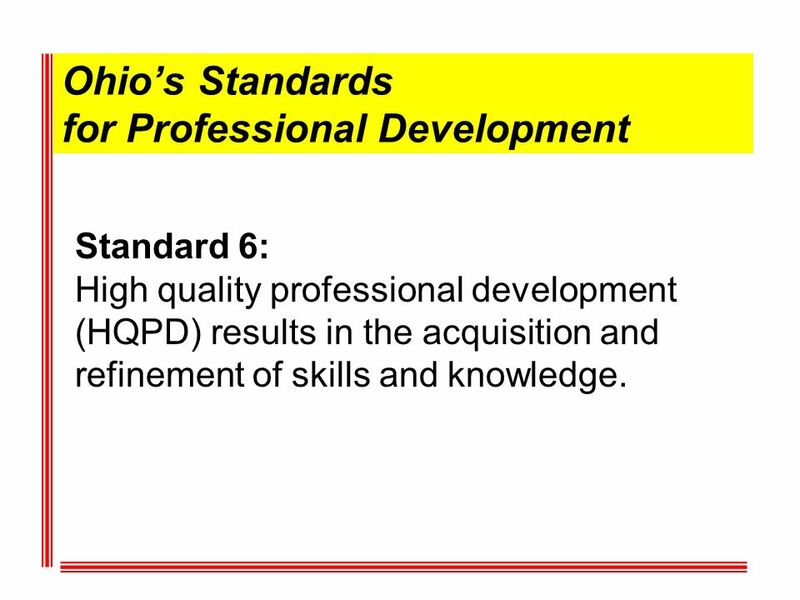 23 Ohios Standards for Professional Development Standard 6: High quality professional development (HQPD) results in the acquisition and refinement of skills and knowledge. 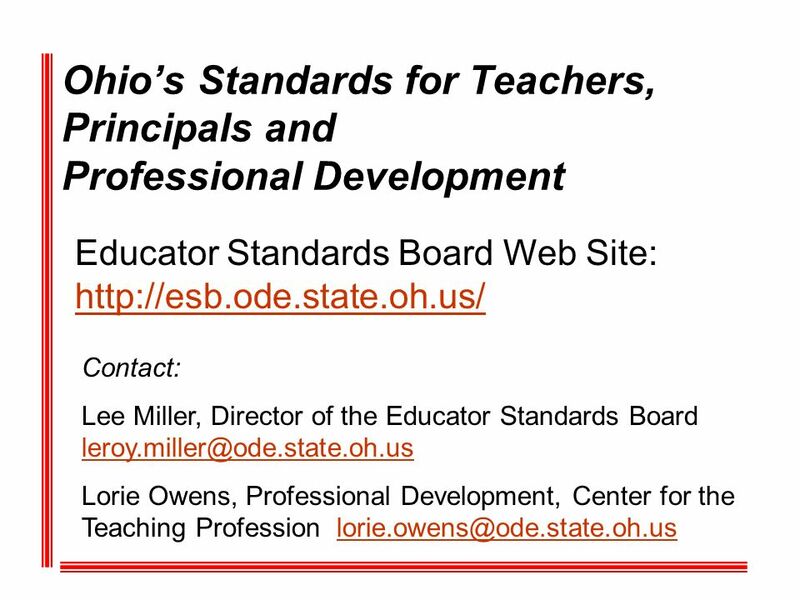 Download ppt "Ohios Educator Standards. 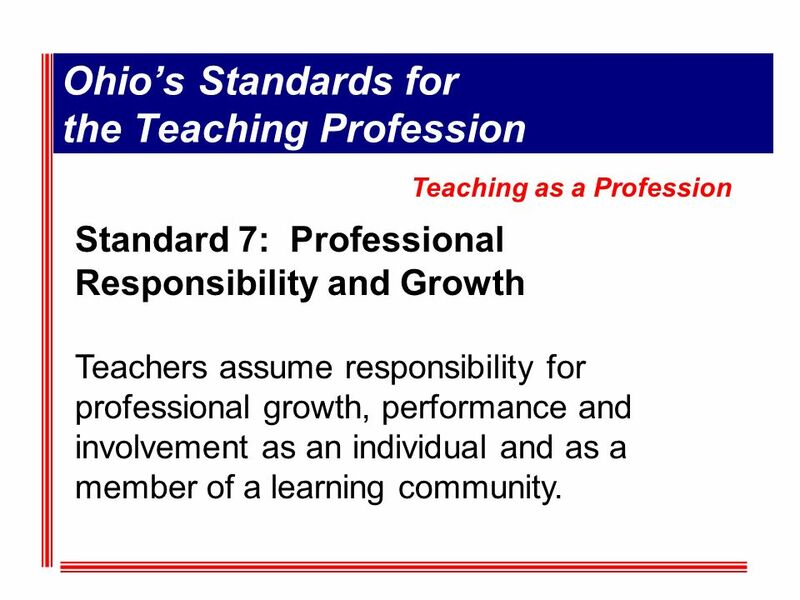 Ohios Standards for the Teaching Profession." 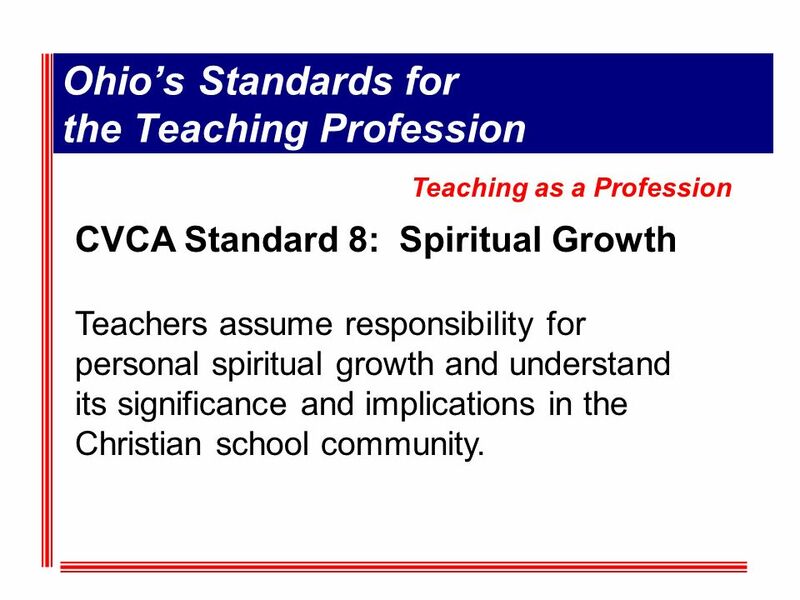 Ohios Educator Standards GCCAA Meeting January 21, 2010. 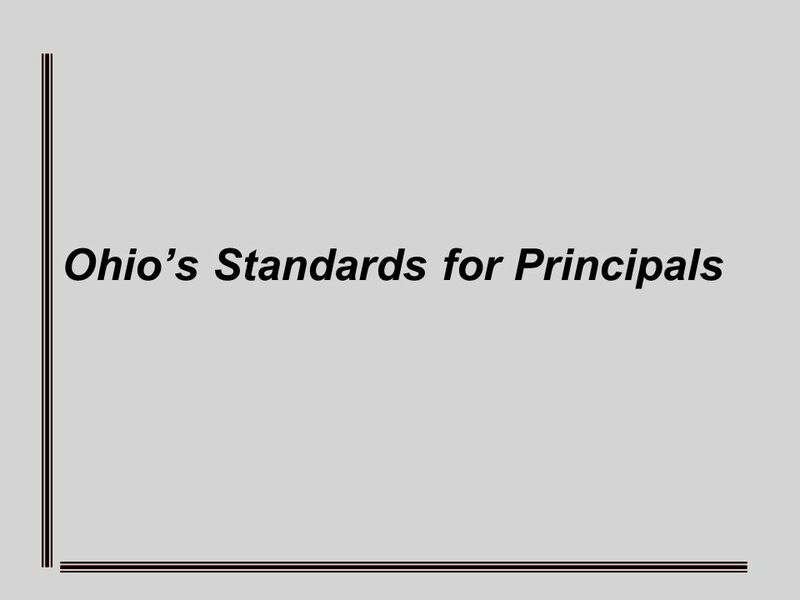 The Principals Role in Systemic Change for Reading Commitment. TEACHER EVALUATION What it is going to look like…. 1 Why is the Core important? 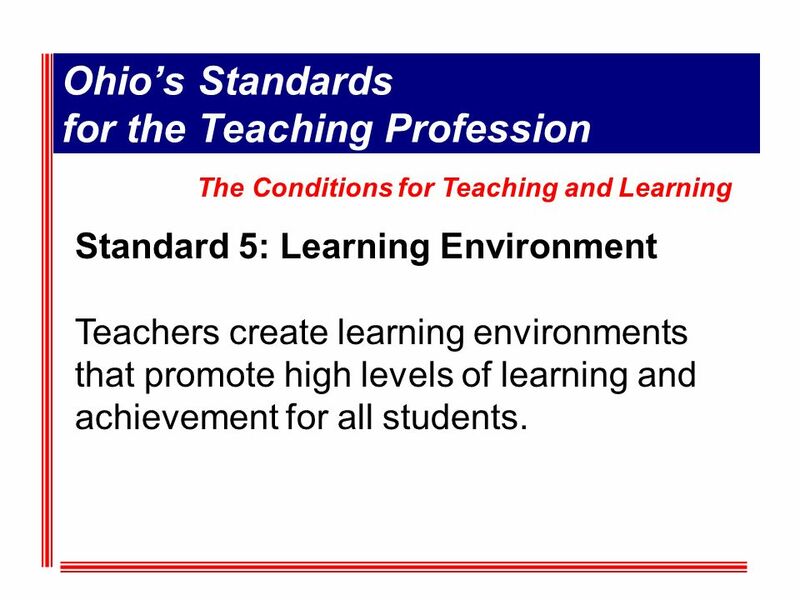 To set high expectations – for all students – for educators To attend to the learning needs of students To break through the. 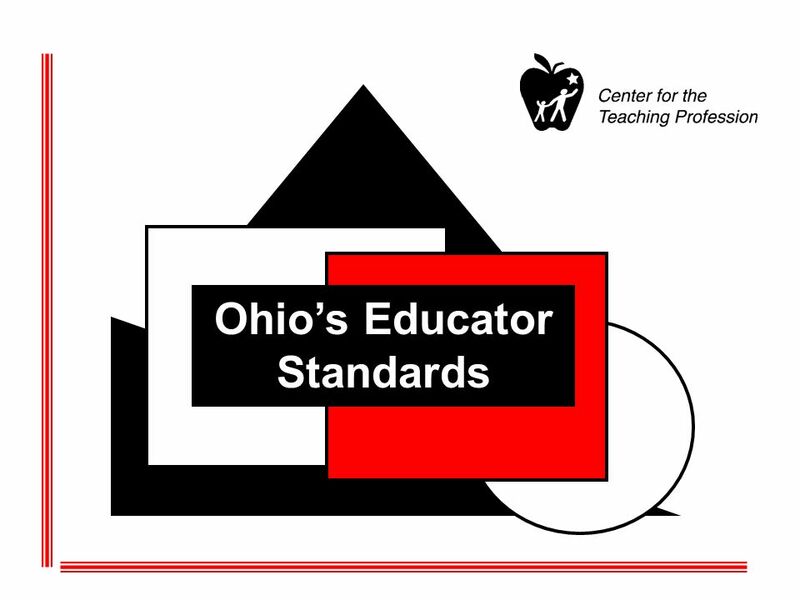 Enter System Name AdvancED TM External Review Exit Report Catalyst High School May 11,12,13, 2014. The Literacy and Numeracy Secretariat Le Secrétariat de la littératie et de la numératie October – octobre 2007 The School Effectiveness Framework A Collegial. 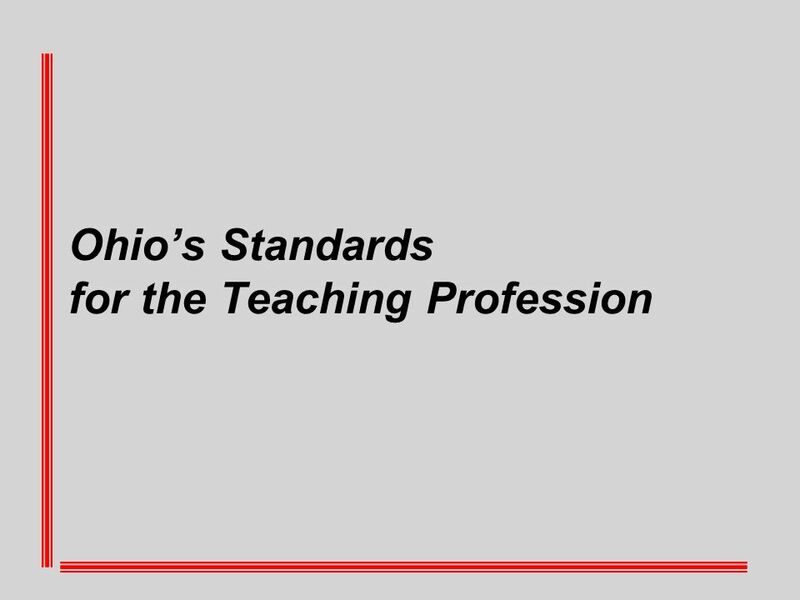 STRATEGIES AND SUGGESTIONS FOR BEGINNING SCHOOL ADMINISTRATORS BY MACARTHUR JONES ROSANNA LOYA MICHAEL SAENZ FALL 2011 A Leader’s First 100 Days. CONNECTICUT ACCOUNTABILTY FOR LEARNING INITIATIVE Executive Coaching. 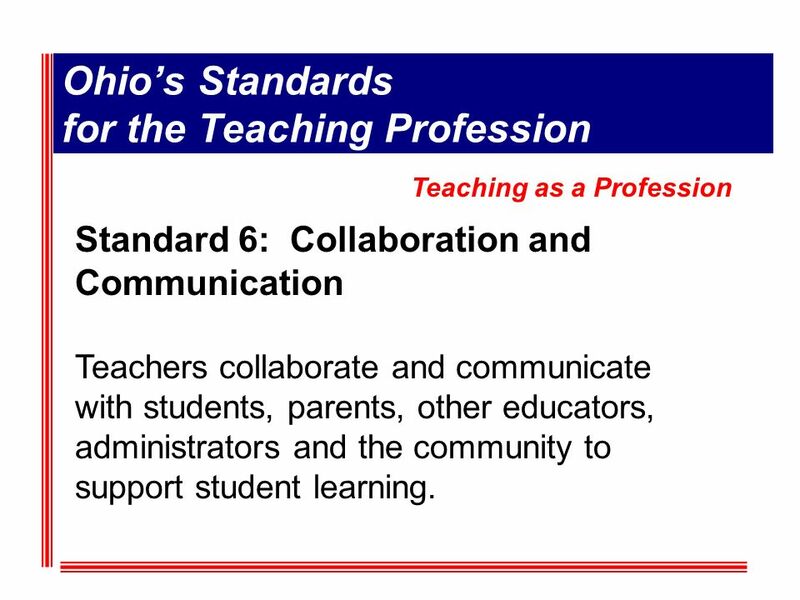 New York State Professional Development Standards S/CDN 2010. 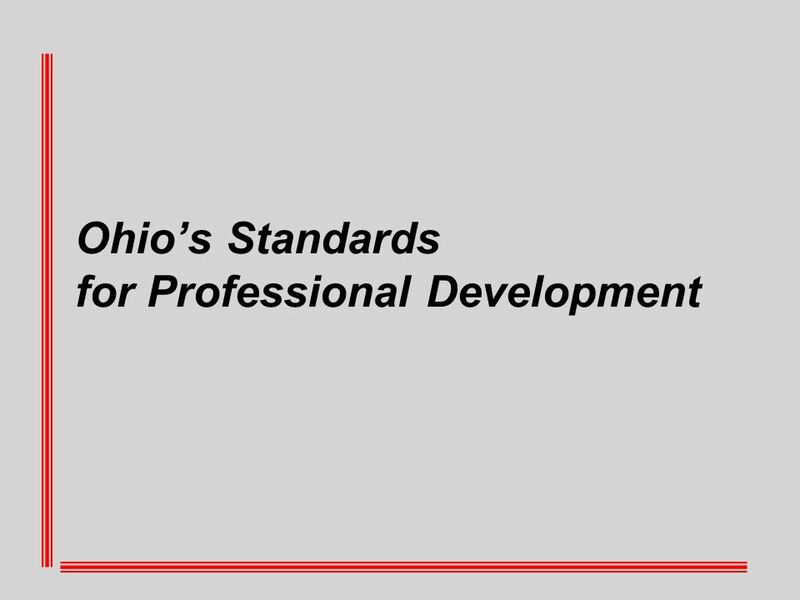 Developing School-Based Systems of Support: Ohio’s Integrated Systems Model Y.S.U. March 30, 2006. APPR How to be a HIGHLY EFFECTIVE World Language Teacher How to be a HIGHLY EFFECTIVE World Language Teacher.